In a brilliant pitcher's duel that lasted eight innings between Philadelphia's Aaron Nola and Boston's David Price, the Red Sox walked-off a 2-1 win in the 13th inning. 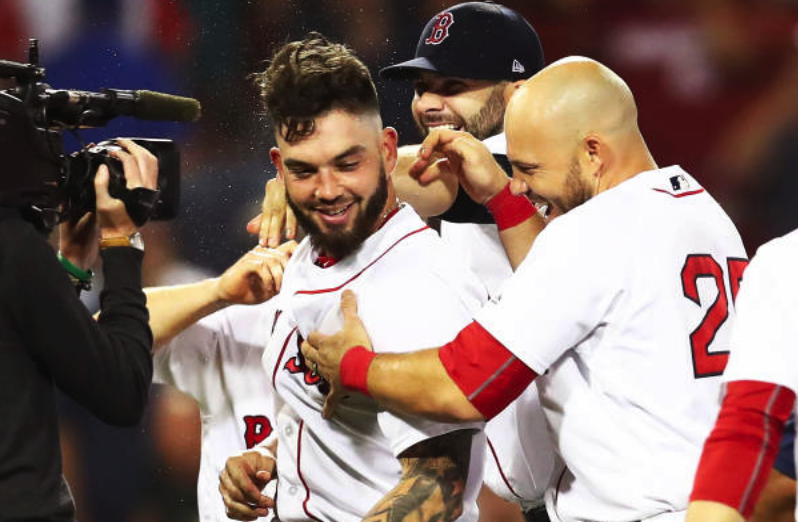 Blake Swihart laced a double into the Red Sox bullpen scoring Eduardo Nunez from second (after he stole a base) with the winning run. Price and Nola matched each other batter-for-batter—as both left the game when it was deadlocked at 1-1. Philadelphia had an early opportunity to add to a then 1-0 lead, but ran into a bizarre double play on the base-paths that saw a put-out at third base and a rundown out at the plate. The other Boston run scored on a Nunez triple—scoring Jackie Bradley, Jr. to tie the game at 1. Boston managed only seven total hits over the 13 frames, while the Phillies notched ten. The Red Sox bullpen performed brilliantly—with Tyler Thornburg, Ryan Brasier, Heath Hembree, Joe Kelly and Hector Velazquez hurling five scoreless innings. The win puts Boston at 42 games over .500 and pushes their lead in the AL East to six games over The Evil Ones.